OPC for Arundel is : Nobody yet! Why don't you volunteer? 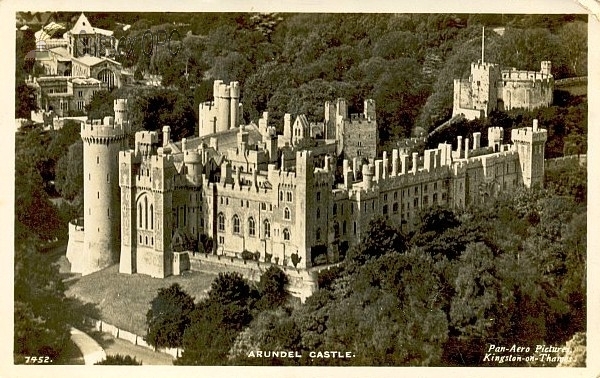 The ancient town of Arundel is situated between Brighton and Chichester on the River Arun which gives the town its name and is tidal here. The Castle dominates the town and has been occupied by the Dukes of Norfolk for over 500 years. The Keep is Norman, whilst the inhabited part is more modern. The parish church, dedicated to St Nicholas, is possibly unique in that the original chancel remains the (Roman Catholic) FitzAlan chantry chapel. North of the Castle is the park containing the Swanbourne Lake and the remains of Roman and Celtic earthworks. 2624 individuals in the OPC Database for the 1841 census. 15 individuals in the OPC Database for the 1851 census. 14 individuals in the OPC Database for the 1861 census. 8 individuals in the OPC Database for the 1881 census. 18 individuals in the OPC Database for the 1891 census. Grid reference: 501974, 107247 ~ View on: Google Maps, Open Street Map, Streetmap, National Library of Scotland Map or Oldmaps. The OPC database contains 164 poll register entries for people entitled to vote in this parish. The OPC database contains 369 entries for people associated with this parish mentioned in Gazettes. There are 201 images depicting this parish in the OPC database. The OPC database contains 332 postal directory entries for this parish, (breakdown below). 149 entries from the 1791 Universal British Directory. 183 entries from the 1823 Pigot's Directory of Sussex. 1791 Universal British Directory for Arundel. 1823 Pigot's Directory of Sussex for Arundel. 1840 Directory of Sussex for Arundel. There is 1 book about this parish in the Sussex OPC Bibliography. There are 26 articles about this parish in the OPC Sussex Archeaological Collections Index. There are 38 people from this parish in the OPC Sussex Archeaological Society Members Index. The OPC database contains 4 wills which mention this parish.